Patient safety and quality are paramount at Lakeridge Health, in Durham, Ontario. The use of prospective analysis has provided us with the opportunity to understand systemic issues in a hospital organization and, as such, to implement sustainable changes that are meaningful to staff and will ensure an enhanced patient experience. To complement Accreditation Canada required organizational practices and a commitment to continuous quality improvement, Lakeridge Health has recognized how an inter-professional approach, staff engagement and use of quality tools support the focus on quality and safety. The implementation of best practices (both clinical and administrative processes) has been possible as a direct result of using this approach. This article outlines three case studies representing different applications of the prospective analysis methodology: ensuring safety with endoscopy processes, minimizing risk in narcotic administration and enhancing infection control practices. In each case, the methodology of prospective analysis was used to ensure the implementation of sustainable change that spans all sites in a multi-sited health facility. This article also includes lessons learned in an effort to understand and implement this quality methodology in healthcare. Starting in 2004 Accreditation Canada introduced required organizational practices (ROPs) that focus on integrating patient safety into their Healthcare Organization Quality Assessment Process (Accreditation Canada 2008). One ROP requires healthcare organizations to conduct at least one annual patient safety-related prospective analysis and then implement the appropriate improvements to mitigate potential error or risk. Prospective analysis permits the assessment of complex processes and systems that can be "fraught" with potential risk as a result of human error. Avanthi Goddard and Associates (2007) identified six principles of improvement that can be used during the process of completing a prospective analysis: simplify key processes, standardize work processes, improve verbal communication, create a learning environment, promote effective team functioning and anticipate that humans make errors. Lakeridge Health is a large multi-site community hospital organization located in Durham region, just east of Toronto, Ontario. This hospital system consists of three full-service acute care sites and one free-standing centre for rehabilitation and complex continuing care. The hospital offers a broad range of in-patient and ambulatory programs including three emergency departments providing over 125 thousand visits per year, 311 acute care beds, 32 mental health beds, 48 rehabilitation beds and 108 in-patient complex continuing care beds. In 2007, Lakeridge Health began using prospective analysis to review several patient care systems and processes. In this article, we review three case studies representing different applications of the prospective analysis methodology: ensuring safety with endoscopy processes, minimizing risk in narcotic administration and enhancing infection control practices. Each case study outlines how staff at Lakeridge Health reviewed practices/processes, how the situation was assessed and the sustainability plans that were put in place. Although there have been both supportive and challenging situations with assessments, change implementation and evaluations, Lakeridge Health has identified the benefits of prospective assessment. Current structures, processes, practices and modifications allow for continuous enhancements for the patient and family experience. Prospective analysis is used as an analytical tool to assess and mitigate the occurrence of loss by analyzing a situation or process that carries with it some inherent risk (Carroll 2006). Its purpose is to identify the way in which a process might potentially fail, with the goal to eliminate or reduce the likelihood or outcome severity of such a failure (Medical Risk Management Associates 2008). Prospective analysis, or failure mode and effects analysis (FMEA) specifically, can be applied to processes, equipment and systems (U and Walsh 2007). FMEAs are used proactively when designing a new system or process, when a process changes, for a high-risk or complex process or during an inter-professional process with hand-offs and interdependent steps (Avanthi Goddard and Associates 2007). Prospective analysis has its roots in the engineering industry. Historically, it has been used to analyze product manufacturing processes (DeRosier et al. 2002). There are several instruments used by reliability engineers and technical specialists for prospective analysis or proactive error management (Reason 1997). However, the literature primarily centres on the use of FMEA and its benefits. Accreditation Canada uses FMEA methodology as an example of a prospective analysis for healthcare organizations to complete a quality process review. In the United States, the Department of Veterans Affairs (VA), with assistance from the Tenet Health System (Dallas, Texas), took the lead in 2001 by developing the Health Care Failure Mode and Effect Analysis (HFMEA) tool. The VA felt a customized tool was necessary for healthcare after determining that models from other industries were of limited utility for healthcare applications (DeRosier et al. 2002). HFMEA uses an interdisciplinary team, process and subprocess flow diagramming, failure mode and failure mode cause identification, a hazard scoring matrix and a decision-tree algorithm to identify system vulnerabilities (DeRosier et al. 2002). In Canada, the Institute for Safe Medication Practices (ISMP) has adapted the VA model. The ISMP Canada FMEA framework has eight steps to identify potential failures and support the implementation of improvements. The Institute for Healthcare Improvement (IHI) has also developed an interactive seven-step FMEA tool and scoring system to calculate risk priority numbers and track improvement over time (IHI 2004). Prospective analysis is most successful when applied by an inter-professional team that reviews a process with a defined and manageable scope (DeRosier et al. 2002). DeRosier et al. (2002) state that it is better to have fewer actions that are implemented versus actions that are half addressed or ignored; to invest in resources (time and commitment of team members) to undertake prospective analysis; and to have multi-level commitment and support for the process. Endoscopy is a medical procedure involving the passing of a long, flexible, lighted tube, called an endoscope, into the gastrointestinal tract for the purpose of visualizing portions of the tract to treat or diagnose disorders without performing major surgery. The province of Ontario has a Colon Cancer Check Program, a screening program supported by Cancer Care Ontario and the Ministry of Health and Long-Term Care aimed at reducing deaths from colorectal cancer by increasing the early detection of the disease. Colorectal cancer is one of the leading causes of cancer death in Ontario. Yet the disease is preventable and treatable if detected early. Lakeridge Health has seen an increase in the demand of the endoscopy service at the Oshawa site. To meet these demands, the endoscopy department expanded to three procedure rooms, increasing capacity and workflow within a small physical footprint. This change, coupled with difficulties encountered with new high-definition equipment and scopes, necessitated the need to complete a prospective analysis (FMEA) for the care and handling of the scopes within the endoscopy department. One incident within the department led to the determination that the care and handling of the scopes is a high-risk process - a process in which a failure of some type is most likely to jeopardize the safety of the patients cared for within the endoscopy department. In May 2008, a multidisciplinary team was formed to begin the analysis. Members of the team had either direct knowledge of the processes involved, were responsible for change or had in-charge responsibilities. The team members included a consultant in organizational learning, a safety coordinator, an infection control practitioner, a director of surgical program, a clinical leader, a sterile-processing department manager, a clinical educator, a surgical supply coordinator, nurse representation from each of our three sites, an endoscopy technician and a physician representative. The goal was to identify our current processes for the care and handling of the scopes and to determine how and why failure may occur and how improvements could be made to enhance safety. The team analyzed the work, creating a diagram of the process steps from the time a scope left the scope cabinet to the time it was returned. This provided the team with a visual perspective that prepared them for the next step - a brainstorming session for potential failure modes and a determination of their potential causes. The team struggled initially in focusing on the process rather than individuals, asking why, not who. The team went on to identify actions for change and failure causes having the highest priority. After eight months, the team implemented their process changes using a comprehensive education plan and a collaborative communication campaign to spread the message to all staff and physicians. The engagement of the front-line staff on the FMEA team facilitated additional champions who then assumed the roles for monitoring and evaluating the change processes. Sustainability for the process changes has been aided by the adoption of clinical best practice guidelines and standards. A unit practice council was initiated to provide a forum for discussion, development and support for evidence-based clinical practice and quality patient-focused care. Narcotics are a high-risk class of medications. They are frequently implicated in incidents causing patient harm, as is documented in the ISMP Canada incident database. Patient safety concerns related to narcotic administration arise due to many factors, including access to a large selection of different forms of a narcotic product (i.e., immediate release, controlled release product, etc. ), products that look the same and sound similar in name, packaging and labelling issues and complex technologies used to administer and control dosage (e.g., infusion pumps and patient-controlled analgesia). In June 2007, Lakeridge Health implemented a new voluntary electronic incident reporting system to track good catches and actual events. In August 2007, the number of reported narcotic medication incidents increased significantly on one complex continuing care unit. The majority of patients on this unit require potent and frequent narcotic medications for pain control. Hydromorphone and morphine were physically separated into different medication carts. Laminated cross-reference guides with narcotic generic and trades names were placed on each medication cart. Daily narcotic drug record documentation forms were revised to incorporate TALLman lettering to differentiate "HYDROmorphone" from "MorPHINE." Staff were educated on the system-based causes of medication errors. An independent "double-check" by a second nurse prior to administration was introduced . During the change process, nursing staff initially felt that the implementation of the independent double-check was a punitive act that targeted the unit for making and reporting narcotic medication errors. However, resistance to this change was addressed through the continuous focus of the leadership team on patient safety, not on individual staff. The manager maintained open communication and had ongoing discussions with staff to keep them informed of best practices and safety literature. Healthcare-associated infections can have a significant negative impact on patient outcomes and hospital use. The presence of Clostridium difficile organisms in hospitals is a significant issue due to its resistance to most chemicals. In addition to enhanced cleaning to keep C. difficile controlled in the hospital environment, early identification of and appropriate response to patients with symptoms of diarrhea is critical. A need for access to policies on the Lakeridge Health Intranet, "the WAVE"
As a result of the extensiveness of the potential risk issues, both a Hand Hygiene Task Force and a CDAD (C. difficile-associated diarrhea) Task Force were created to formulate and implement solutions to improving the management of patients with diarrhea. The recommendations from these groups that are being implemented include modifications to the Lakeridge Health infection control admission screening tool; additional education related to hand hygiene and routine practices; the creation and distribution of an infection control handbook the development of an algorithm for CDAD management and improvements to isolation signage. The use of prospective analysis in this situation helped the team understand the need for a multi-faceted approach to reduce risk to patients. This FMEA was completed within nine months. Sustainability of the results were promoted with hospital requirements for public reporting of C. difficile results in addition to hand hygiene compliance rates. The development of core competencies for infection control practices will contribute to ongoing sustainability. The completion of prospective analyses using FMEA tools has guided our inter-professional team using clearly defined steps. There are several similarities but some differences in the use of FMEA in each case. Each FMEA identified that the process was multi-factorial, and the use of process maps guided the understanding of steps that have the potential to increase the risk of harm to patients. Analysis of these high-risk activities required inter-professional and intradepartmental team involvement. Each FMEA assessed the existing processes, developed action plans and provided staff with knowledge through education and communication. The time for completion of the FMEAs ranged from eight to 12 months. All three FMEAs were accomplished in clinical areas, with two (narcotics administration and infection prevention and control) impacting organization-wide processes. Each FMEA resulted in tools to assist staff, such as policies and procedures, handbooks, algorithms, log books and education materials. Lakeridge Health also noted differences between the three FMEAs. The origin of the high-risk potential failure came from varying sources: one incident, multiple incidences and existing processes. Staff reactions to the implementation and action plan also varied. The teams noted that during the implementation phase, there were both resistance to change and an embracing of change. Through ongoing staff support and encouragement, staff had the opportunity to identify impacts on their practices, understand the changes that were required and recognize that the status quo was no longer an option. The resources dedicated to the process of completing an FMEA at Lakeridge Health varied across the teams. Although each team had an inter-professional approach, members included all stakeholders who were involved in the particular department or unit, such as endoscopy technicians, service assistants, administrative support, physicians and nursing leaders. Meetings were scheduled based on the team outcomes and varied from weekly to monthly. The time for completion of the FMEAs also varied from approximately 250 to 300 hours. The time resources included clerical support, team meetings, audits, monitoring results, analyzing results, developing algorithms, celebrations and presentations both internal and external to the organization. Many tools are available for quality improvement within healthcare organizations. The use of FMEA for prospective analyses allowed team members to review various tools such as process maps, priority matrices, flow diagrams and picture storyboards. Other tools can also be used to support the process and to clarify the context of the potential risk being addressed. A prospective examination of structure, processes and practices allows organizations to identify potential risk elements of patient care. Lakeridge Health has found prospective analysis to be a valuable tool that allows for all levels of staff to be engaged in the process. In each of the prospective analyses, project management of the FMEA by the director and demonstrated support by the senior team contributed to success. "Sustainable high-quality care is only possible through simultaneous attention to enhancing the entire experience of care and managing costs" (IHI 2008). These efforts of quality improvement at Lakeridge Health have achieved improvements to the patient experience as well as efficiencies and potential cost savings by removing redundant steps. Lakeridge Health has asked departments that have successfully implemented a prospective analysis to share their experience at various committees within the organization. Coaching and mentoring of novice users of such quality improvement tools will be encouraged to augment knowledge transfer and utilization. Beverley Tezak, RN, BA, MAEd, MHSc, CHE, is the director of quality, patient relations and policy at Lakeridge Health, Champlain Office, Oshawa. Carol Anderson, BScN, MScN, is the vice president of patient care and site lead for Lakeridge Health Port Perry and Whitby sites of Lakeridge Health. Annette Down, BA, MHSA, CHE, is the leader/director for risk management and patient safety at Lakeridge Health, Oshawa. Helen Gibson, RN, MBA, is the director of infection control, environmental & volunteer services and centralized staffing at Lakeridge Health, Oshawa. Brenda Lynn, RN, BScN, MSN, CPN (c), is the director of surgery, Lakeridge Health, Oshawa. Shelley McKinney, RPh, MBA, is the director of pharmacy, Lakeridge Health, Oshawa. Christena Selby, RN, is the clinical leader of 8M and 9M Medicine at Lakeridge Health, Oshawa. Lorraine Sunstrum-Mann, ECEDH, RN, BA, MBA, is the chief nursing executive and vice president professional affairs at Lakeridge Health, Oshawa. Accreditation Canada. 2008. Required Organizational Practices. Ottawa, ON: Author. Retrieved December 24, 2008. < http://www.accreditation-canada.ca/default.aspx ?page=355.t > . Avanthi Goddard and Associates. 2007. 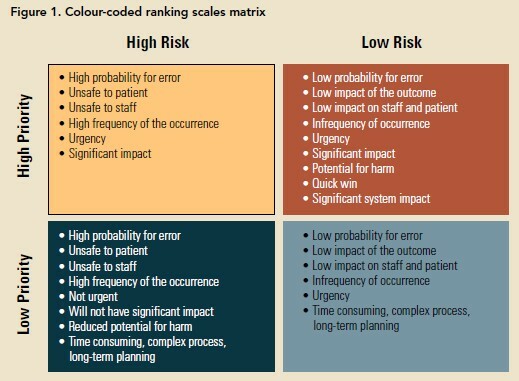 Fostering a Patient Safety Culture - Prospective Analysis. Sioux Lookout, ON: Sioux Lookout Meno Ya Win Health Centre. Retrieved December 19, 2008. < http://slmhc.on.ca/downloads/Prospective Analysis_000.pdf > . Carroll, R. 2006. Risk Management Handbook for Health Care Organizations (5th ed.). San Francisco: Jossey-Bass. DeRosier, J., E. Stalhandske, J.P. Bagian and T. Nudell. 2002. "Using Health Care Failure Mode and Effect Analysis™: The VA National Center for Patient Safety's Prospective Risk Analysis System." Joint Commission Journal on Quality Improvement 27(5): 248-67. Institute for Healthcare Improvement. 2004. Failure Modes and Effects Analysis (FMEA). Cambridge, MA: Author. Retrieved January 12, 2009. < http://www.ihi.org/NR/rdonlyres/ABD4EA77- 9AD3-4AC4-83BF-7E7C68FCDBAA/972/ FailureModesandEffectsAnalysis_FMEA_1.pdf > . Institute for Healthcare Improvement. 2008. Link Quality and Financial Management: Strategies to Engage the Chief Financial Officer and provide Value for the Patients. Cambridge, MA: Author. Retrieved December 11, 2008. < http://www.ihi.org/IHI/Programs/Improvement Map/LinkQualityandFinancialManagement.htm > . Medical Risk Management Associates, LLC. 2008. What Is the Difference between Root Cause Analysis (RCA) and Failure Mode and Effects Analysis (FMEA)? CCD Health Systems. Retrieved December 29, 2008. < http://www.sentinel-event.com/rca-fmea.php > . Reason, J. 1997. Managing the Risks of Organizational Accidents. Hampshire, England: Ashgate Publishing Limited. U, D. and D. Walsh. 2007. "Failure Mode and Effects Analysis: Proactively Identifying Risk in Health Care." Hospital News 20(2): 23. The medication-safety initiative brings up a good point--even with new guidelines in place, staff and management must be on the same page to make sure they are actually followed through.